I know I just posted a waffle recipe, but I couldn’t resist showing you my latest version: Pumpkin Waffles. 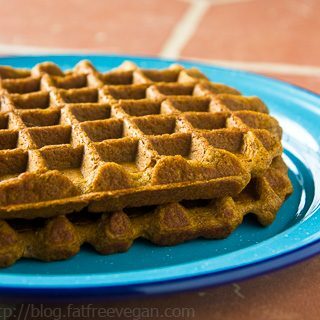 I had a craving for pumpkin (must be that fall nip in the air) and decided to see if I could make a fat-free pumpkin waffle using gluten-free flours. 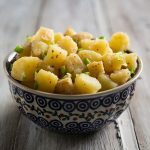 Although my family and I are not gluten-free, I know that a lot of my readers are, so I like to offer a gluten-free option from time to time. If I say so myself, these pumpkin waffles were amazing. As soon as the batter hit the waffle iron, the tantalizing aroma of pumpkin and spices filled the air, luring my husband to the kitchen. He eagerly began eating the first waffles while I continued to cook the rest, grabbing the camera between batches to take the photo you see above. I was still cooking waffles when I thought to ask my husband how they were. “Delicious! I was so busy eating that I forgot to say.” “Delicious for gluten-free or just delicious?” “These are gluten-free?” Nuf said. 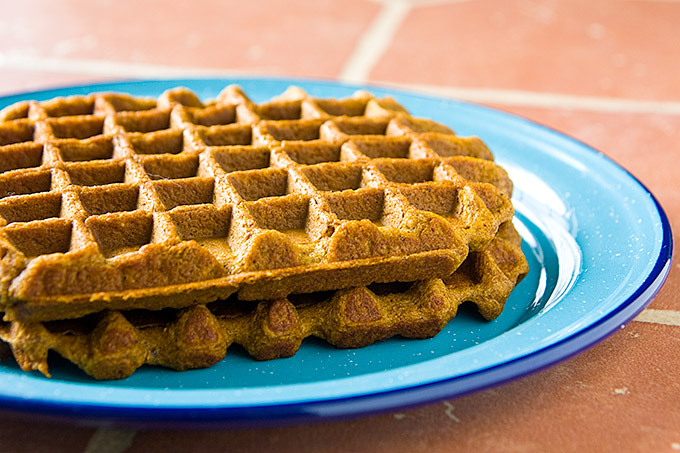 A tantalizing blend of spices makes these pumpkin waffles amazingly delicious. Don't mention that they're gluten-free and vegan and no one will know. Mix all ingredients except orange juice and set aside to rest while you heat your waffle iron. Once the waffle iron is hot, add the orange juice to the batter and stir. Spray the iron lightly with canola oil (if you know your waffle iron is very non-stick, you can skip this step, but unfortunately most waffle irons do stick.) Follow manufacturer’s directions to make waffles. (Batter will be very thick; add more orange juice or water if you want a thinner batter.) You may need to spray the iron between waffles to avoid sticking. Makes 4 servings, about 2 average-sized waffles per serving. Thank you so much. I made mine with butternut squash. My son literally cried for more. how would I adjust this recipe if I wanted to make regular pumpkin pancakes (not gluten free)? I don't know why it took me so long to try these. I think there may have been no canned pumpkin in the store at the time, and then I never got back to it. I'm glad I finally got around to it. These are absolutely delicious! I have done a lot of gluten free baking in the last year, but hadn't really found a gf waffle recipe that was low fat enough for me. Thanks for giving me one I don't have to fiddle with unless i want to! This will be my "go to" gf waffle recipe from now on. They were particularly scrumptious with a tiny drizzle of maple syrup, sliced banana, a spoonful of your soy yogurt, and another small drizzle of molasses and then one of orange juice. Yum yum! 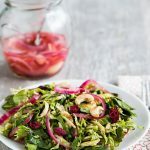 I experimented with this recipe to see if I could substitute 3/4 cup of banana (about 1 1/2 banana)–it worked great. I also added two tablespoons of roasted kasha for some crunch. And used maple syrup, since I was out of agave. All good. Also, a caution about using leftover pumpkin canned pumpkin–it made the batter too thin and the waffles stuck. They were still good though. If I am in that situation again I might add less soymilk, but didn't think of it until it was too late. Thanks for a great recipe to play with! Any tips on making these whole wheat instead of gf? I have a hard time substituting whole wheat flour in recipes. These sound delicious. Christina, try using 1 1/4 cup whole wheat flour and only 1 teaspoon of potato or corn starch. Adjust the liquid if it is too thick. And please let me know your results if you try! I came to ,as I have you in my favorites, looking for a pancake recipe using the many other flours I have. I just can’t get it right when I substitute with whole wheat and maybe half of the recipe with other flours. It just isn’t that easy..the taste can be horrible. Hi susan, I just wanted to ask if I could us just rice flour, would it work? It will work, but my experience with rice flour is that it’s gritty when used without other flours. But if you like it, then it should be fine in this recipe. If you use Authentic Foods Superfine brown rice flour it should work. I have pretty good success with it, haven’t noticed any grittiness. No financial interest in Authentic Foods;-) I made them this morning with mostly brown rice flour since I was almost out of sorghum & they were great. I made these this morning with millet flour instead of sorghum and tapioca instead of corn or potato starch, and they were great. Used cow milk (organic) because that’s what we had on hand. The first two stuck to the waffle iron, but when I used cooking spray on the waffle iron and waited more patiently so they didn’t split apart when the iron was opened, they came out fine. I like my waffles a little more toasty anyway. What could I use instead of sorghum flour? I have some all purpose gf and wonder if that will be okay? I think that will be fine. Any tips for waffle iron brands, timing or heat level? I tried to make these but couldn’t get them to stick together, the waffle would either rip open when I opened the waffle iron, or the waffle would be burnt to a crisp. The remains tasted good, but I couldn’t serve them as a mountain of crumbs. I just made these using teff instead of the sorghum, arrowroot for the starch, stevia powder instead of agave, almond milk, and apple cider vinegar for the acid. All of the substitutions worked wonderfully. You’ve got a fantastic recipe to work with. Thanks! How can I make this recipe low-sodium? Most of it comes from the baking powder and baking soda, and there’s not much you can do about that (unless you don’t want them to rise). You could leave out the salt which would eliminate about 290 mg. I just made these following the recipe exactly. They were awesome! They did stick a little to my non-stick waffle iron so I just buttered the iron a tiny bit and then it was fine. I’ll definitely be making these again, and also trying the banana substitute somebody mentioned, and with blueberries! Thanks for helping me accomodate my vegan husband and my GF son! I’ve followed your blog for a long time, and recently learned i have celiac disease. I made these waffles this morning because it’s chilly and I had a craving for pumpkin waffles, and these really hit the spot! I have a wicked sweet tooth, so I added 3 tablespoons dark brown sugar to the recipe. I also substituted millet for half the sorghum (I didn’t have enough sorghum and really love millet flour), and maple syrup for agave. These waffles are AMAZING. I couldn’t find sorghum flour so I took a gamble and used quinoa flour. They turned out great! They don’t have any of the gritty consistency that most gluten-free foods do. I made these this evening. They were really good. I did add a touch of oil to the better to prevent sticking. Also our waffle maker makes big Belgian waffles. So with doubling the recipe it made 6 waffles. I made these pumpkin waffles this morning delicious flavor but disappointing as when I opened the lid half stuck to the top and half to the bottom…they were a mess ….I sprayed the waffle iron top and bottom each time after 5th waffle I went to my tortilla pan and finished as pancakes….any ideas why this would happen…tasted good but were ugly…Thanks Shelly. P.S. I have DH. Or celiac although I have it completely under control so has to be GF ….. I don’t use canola oil and have had SUPER big stickage having tried coconut oil…..what else can I use to prevent “the stick”? Hi Lottie. Could you be more specific about which program? 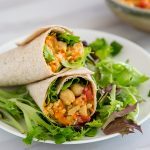 This site is geared toward people following oil-free diets, like the McDougall Plan, so no olive oil except to lightly oil a pan to keep food from sticking (less than 1/16 of a tsp. probably). No oil is allowed on Eat to Live, but whole nuts and seeds and nut butters are. Sure! Steam or bake or prepare pumpkin in your normal way. Then mash it or purée it and drain all the water out of it and use it in the recipe. Fixed your Gluten Free Pumpkin Waffles today! Delicious! A real compliment when my husband said they are delicious just by themselves! This was the best GF waffles I have ever made, and I have been trying many. Thanks so much. What can I use in place of the orange juice? Lemon? Oh man, now I have a craving for waffles! Thanks for posting a GF version! Hi there, Susan. 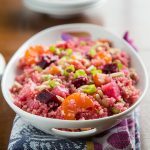 I have been busy pinning a bunch of your gluten free recipes for which I am very grateful for! I know this is an old post but, I hope you can answer. What do you use for pancake and waffle toppings? I have a hard time with this one because I can’t do nut based toppings or sugary ones like maple syrup. Any thoughts? I hear ya 🙂 I like them too, but they don’t like me quite as much! Thank you for your quick reply! Ok, for those of us NOT gluten free, do you think I could just sub in white whole wheat for the two types of flour? Try using 1 1/4 cup whole wheat flour and only 1 teaspoon of potato or corn starch. Adjust the liquid if it is too thick or add more flour if too thin.